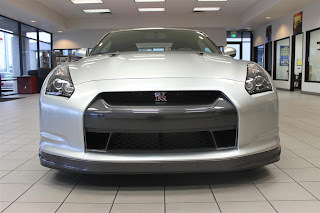 Does the front lip on your 2009-2011 Nissan GT-R look like this? From the Nissan dealer, a replacement front lip can cost up to $1500. Help protect it with a STILLEN Skidplate. It's every GT-R owners worst nightmare, scraping the front bumper on anything from driveways, dips, speedbumps, and pulling into that parking spot with the raised curb and making contact. STILLEN has developed a urethane Skid Plate which protects the OEM fascia and paint from scrapes and light bumps. This piece is specifically molded to the GT-R's front bumper, and installs with 3M automotive acrylic foam tape and self-tapping screws to the underside. Durable urethane construction ensures no cracking, and doesn't require painting, although can be color matched if desired.